Did you know that most children growing up with a father in their home show fewer behavioral problems and are healthier than children in father-absent homes? While much of our work here at WellShare focuses on mothers and children, we know the importance of fathers, not only for their families, but also for their communities. That’s why we work with men and women on all our projects, but particularly on child spacing issues. Justin Akol (pictured right), is a village health team member for WellShare. 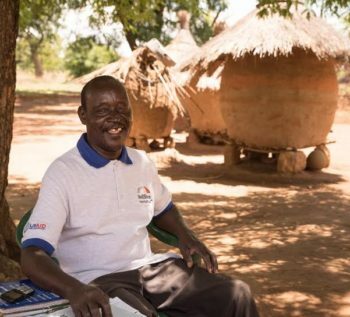 Justin lives in Asinge village in Uganda and is a father of nine children – including his youngest son named “WellShare.” Justin learned about family planning later in life and now counsels families in family planning methods and distributes methods to clients at the village level. He also works on malaria prevention and treats patients that suffer from malaria to ensure healthier families. Justin knows that, because of his efforts, people understand how they can use family planning methods in order to protect their families, especially in times of food insecurity. You can read more about Justin here. We’ve worked with fathers in Minnesota as well. Through our child spacing work, we’ve emphasized the importance of communication and education. This ensures that husbands and wives are working together to discuss their family size in a physically, emotionally and financially healthy way. As you make plans to mark Father’s Day on June 18, consider honoring your father with a gift to WellShare. Your contribution will enable Justin and fathers like him to increase their communities’ health while being there for their families and children.